Canola oil is a versatile cooking oil because it withstands high temperatures well. It as a mild flavor so it is an appropriate choice for almost any type of cooking, baking or in dressings and sauces. Canola oil was developed in Canada by breeding rapeseed plants that produced much lower levels of erucic acid typically found in rapeseed. Erucic acid is toxic in large amounts. 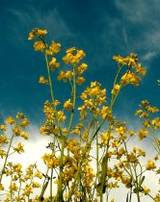 Unfortunately some people misunderstand the difference between canola and rapeseed and there have been email hoaxes and rumors claiming that consuming canola oil is dangerous. But don't worry, these rumors are false. Canola oil contains monounsaturated fatty acids, similar to olive oil, and omega-3 polyunsaturated fatty acids like the fats found in flax seed oil. Eating a diet rich in monounsaturated and omega-3 fatty acids may help reduce your risk for cardiovascular disease and will help to reduce inflammation. The FDA allows food companies to make a qualified claim that canola oil is heart-healthy on product labels.